When I first heard about the Dancers at Sea (DAS) dance cruise from Hong Kong to Dubai, I thought 16 nights was longer than I wanted to be away for. I had also cruised from Hong Kong, to Thailand and Vietnam, when I did the Asia Cruise two years earlier, and had little desire to revisit the two ports on that part of the itinerary. So I decided to take the option of the 9 nights Singapore to Dubai leg. The dates fitted in nicely with my visit to Toronto to see Rhinoceros, the absurdist play my daughter was directing at the University of Toronto Scarborough campus. So I was going to return to Vancouver for three days and then fly to Singapore to board the QM2. When I learned at the last minute that the dance group for the Hong Kong to Singapore leg was unexpectedly very small – therefore there would be much more dance opportunities than usual - and I realized I could fly direct Toronto to Hong Kong instead of taking four additional flights, it took me about three seconds to decide to be spontaneous, blow my budget and my schedule and sign up for the whole 16 night segment. 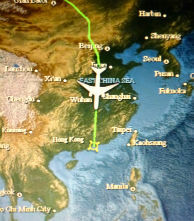 So here I am on an Air Canada direct flight to Hong Kong. It is anticipated that the flight will be 15 hours gate to gate, and then hopefully I will find a Cunard rep to arrange a transfer to the ship. Since I seldom can sleep on a plane, I don’t anticipate feeling up to dancing much on the first evening – more like collapsing into bed for a good 8-hour sleep. The movie selection is strangely unappealing on this flight. I have already seen the couple that I would want to watch and the others hold no interest. Too bad, I was hoping for Iron Lady or Marilyn. So I plan to catch up on my writing and enjoy being forced to relax and do nothing. We were served lunch shortly after take off. The meal service was excellent. There was a nice fresh mixed greens salad with grape tomatoes, parmesan cheese and a balsamic vinaigrette. 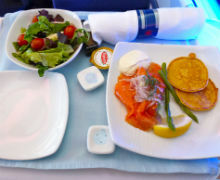 Also Atlantic smoked salmon beautifully presented with asparagus, mustard dill crème fraiche, and two sweet potato blinis which I did not eat. I chose the grilled Mediterranean Sea bass with roasted fingerling potatoes, grilled. vegetables and cherry tomatoes. A cheese and fruit plate, yellow cheddar, Camembert and Oka with red grapes was the perfect end for me though they were serving a tempting looking streusel, which I declined. I enjoyed a glass of Henry of Pelham Sauvignon Blanc from the Niagara region with my meal and took a small portion of Dow’s Port with the cheese. That sort of knocked me out and I thought "hooray for once I will be able to get some sleep on a plane", but alas not! No sooner had I got myself comfortable than my mind clicked into "you are on a plane - stay awake" mode and that was it for the rest of the trip. I was amazed at how many people around me seemed to go to sleep shortly after take off when it would have been the middle of the morning for them. It is ten hours into our flight, now 8 PM Toronto time and 8 AM Hong Kong time, and we are about 4 and a half hours and 2421 miles away from Hong Kong. I have been drinking copious amounts of water to keep hydrated but that necessitates repeated trips to the washroom. At least it is an excuse to get up and walk around. The Air Canada cabin crew is great but I am definitely feeling stir crazy. I have caught up with a lot of writing, finished one book on my IPad, watched one episode of Downton Abbey (a show which I have never previously watched but had positive recommendations from several friends) and declined ice cream and alcohol other than with the meal. I thought Downton Abbey warranted the positive recommendations and plan to watch it from the beginning when I get home. Great acting and characterization of relationships. Two hours before landing breakfast was served. We got orange juice, fruit and yogurt, croissants and blueberry muffins. Rather than congee, I chose the parsley omelet served with chicken sausage, roasted potatoes, cottage cheese and red pepper relish. Not bad. Hong Kong Airport to Cruise ship. Because I had changed my flight plans so late, I had not been able to organize a transfer to the ship through Cunard but Wendy told me to look out for a Cunard rep after immigration and customs and just arrange for a transfer on the spot. The walk through Hong Kong airport seemed endless. With hundreds of others I got on the train that takes you to the terminal area where immigration is. The lineups at immigration were interminable. They must have had a thousand people lining up and it took about 40 minutes to get though immigration. The good side of that was that I spotted my checked bag immediately after clearing immigration and in minutes I was outside looking around for a Cunard sign. Nothing. I walked around the tourist meeting area, searching for the Cunard rep. I was just thinking I would have to take a taxi, when on my third walk around I spotted two people who had just arrived with Cunard sign. After a bit of confusion when they told me I would have to take a cab for 400 HK dollars ( I winced till I realized that was only about 50 Canadian), the boss man arrived and within 5 minutes I was on a bus with a nice family from Singapore who were also heading o the QM2. The check in was on board. It was quick and painless and I was very impressed with Cunard's efficiency - until later that night - as you can read about in the next post. I found my way to inside cabin at the aft end of the ship that I was sharing for the first leg of the trip and met our steward Larry. He was very helpful, getting extra hangars, pillows and towels, and I settled on my bed, to await the arrival of my luggage. At that stage all I wanted was a shower and sleep but I was determined to stay awake till after supper at 6 pm. I did but barely so.